What Garbage Car Had Every Right To Be Good? Every so often, you get what sounds like a perfect recipe. It has all the right ingredients, seemingly in all the right proportions. Then they’re all added together, and the result is a bit crap. Like the Mercedes-Benz SLK 55 AMG Black Series. Did you know (seriously, did you know????) that Mercedes still makes the SLK 55 AMG? That it still comes with the 5.5-liter V8 that all AMGs used to have? It’s a front-engine, rear-wheel drive little roadster, from Mercedes, and you probably haven’t given one merest morsel, one little bit of a thought to it in the past five years. It should be perfect, but instead, people tend to forget it even exists. In fact, as far as I’m aware, the base SLK is the only Mercedes in the US that’s still available with a manual transmission. Feel free to fact-check me on this one, but we all know you won’t because you don’t care about the SLK. I could say it’s got space thrusters that shoot 20-year-old expired packets of Nerds candy out the sides, and you’d believe me because it’s too much effort to think otherwise. 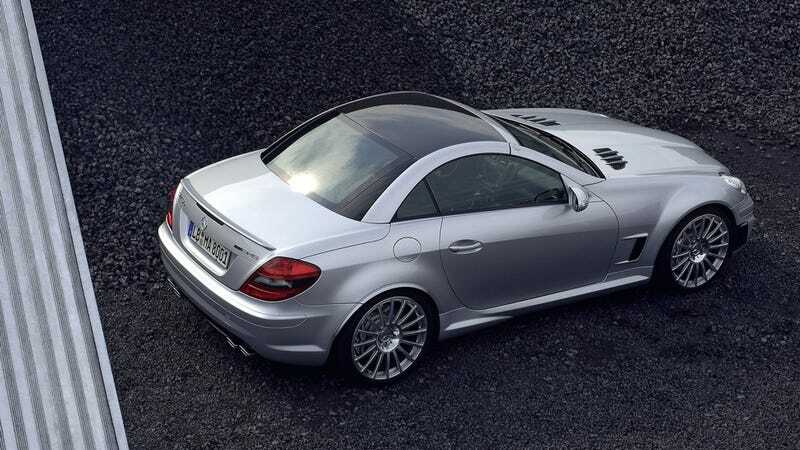 The SLK, in general, has all the right bits to be one of the all-time great cars, and for some reason, it isn’t. But nothing epitomizes this more than the SLK 55 AMG Black Series, which you didn’t even know existed until just now. Yeah, they made it for about two years, and you’ve never seen one. It feels like a ‘tuned’ product, a car that’s been developed from a lesser model to perform way beyond its normal remit. The GT3, in contrast, feels like a clean-sheet design. That strange shadow that follows you around in the Black is just an illusion. In reality the GT3 is way out ahead and well out of reach. The gearbox is a huge limiting factor too, refusing to downshift when asked and forcing the driver to keep too close an eye on the gear indicator rather than the track unfolding ahead. To make things worse still, the Black’s ESP doesn’t disengage completely, which can cost huge chunks of time, especially on the way into a corner. It should’ve been a shining achievement, a testament to humanity surpassing the bounds nature places upon us, and it wasn’t. The suspension was too stiff, and the brakes would get skittish on the track. But the SLK isn’t the only underachiever ever made by a car company. There are plenty out there. What car should’ve been awesome, and against all odds, wasn’t that good at all?